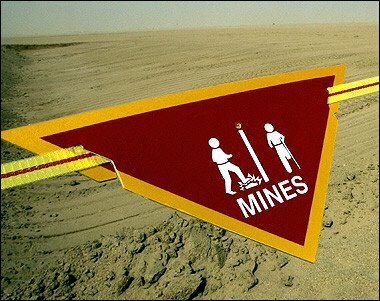 Frightening statistics here on Iraq: A survey of 10,049 Iraqi communities conducted by the Vietnam Veterans of America Foundation found that 2,029 were contaminated by mines and other explosive munitions. That's pretty much one in every five neighborhoods walking on sub-atomic eggshells. Joe Donahue, the foundation's VP, said, "The present conflict notwithstanding, Iraq has no hope of healing and recovering its economic footing without prompt attention to this problem by the rest of the world." 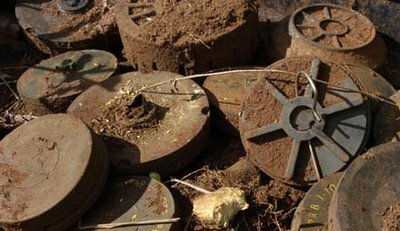 Since the war began, the Mines Advisory Group (MAG), a leading humanitarian mine clearance organization, has cleared more than one million mines of unexploded ordnance (UXO). Since 1992 MAG has cleared 25 million square metres of land of mines or UXO in Iraq. And yet, the country, one of the most booby-trapped in the world, remains littered with thousands and thousands of explosives still waiting to happen. If you could gather these extracted landmine-spaces and place them all together, you'd have roughly 15,500 square miles of sheer terrestrial explosivity, inch-for-inch, not including what has't been extracted yet. That's a land mine a little larger than the state of Maryland. 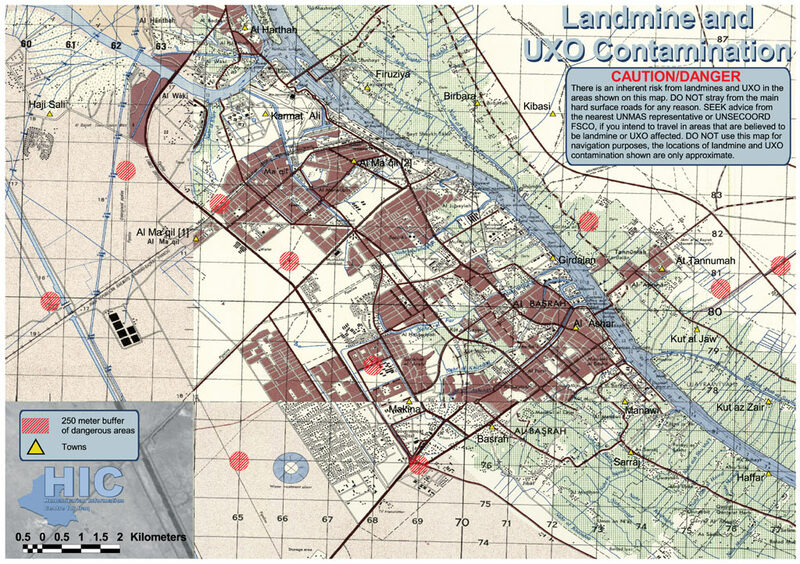 Here's a map of Iraq's volatile landscape in 2003. (pdf). And, another map of contaminated areas as of 2004/2005.